Known around the world as a true mark of excellence for premium cigars, Espada by Montecristo is the latest creation by the Placencia family and expertly blended by the world famous Grupo de Maestros. Espada, which means “sword” in Spanish, are hand-rolled premium cigars constructed with 100% vintage Nicaraguan tobaccos. The binder, a Habano Jalapa Vintage 2009. The filler, a complex blend of Habano Jalapa Seco Vintage 2008, Habano Jalapa Viso Ometepe Vintage 2008 and Habano Condega Ligero Vintage 2008. All of this exceptional tobacco is wrapped up inside a spicy Habano Jalapa Vintage 2010 tobacco leaf, providing you with an elegant, refined premium cigar loaded with amazing complexities. The results from these handmade cigars are as good as it gets. A well-balanced medium-bodied smoke that is layered with smooth richness, hearty notes of wood, pepper, coffee, cream, nuts, and sweet flavors. 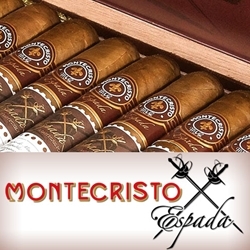 Espada by Montecristo are hand-rolled premium cigars that make an excellent choice for any cigar connoisseur. Smokers Discounts has made it easy and affordable to buy premium cigars online. A variety of sizes and flavors are listed below in our online cigar store. Each of these styles are in stock and available today at a low discount price. Call us for more details!